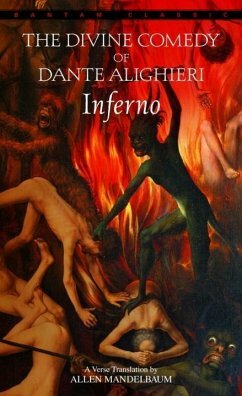 Dante Alighieri was born in Florence, Italy in 1265. His early poetry falls into the tradition of love poetry that passed from the Provencal to such Italian poets as Guido Cavalcanti, Dante's friend and mentor. Dante's first major work is the Vita Nuova, 1293-1294. This sequence of lyrics, sonnets, and prose narrative describes his love, first earthly, then spiritual, for Beatrice, whom he had first seen as a child of nine, and who had died when Dante was 25. Dante married about 1285, served Florence in battle, and rose to a position of leadership in the bitter factional politics of the city-state. As one of the city's magistrates, he found it necessary to banish leaders of the so-called "Black" faction, and his friend Cavalcanti, who like Dante was a prominent "White." But after the Blacks seized control of Florence in 1301, Dante himself was tried in absentia and was banished from the city on pain of death. He never returned to Florence. We know little about Dante's life in exile. Legend has it that he studied at Paris, but if so, he returned to Italy, for his last years were spent in Verona and Ravenna. In exile he wrote his Convivio, kind of poetic compendium of medieval philosophy, as well as a political treatise, Monarchia. He began his Comedy (later to be called the Divine Comedy) around 1307-1308. On a diplomatic mission to Venice in 1321, Dante fell ill, and returned to Ravenna, where he died.? Allen Mendelbaum's five verse volumes are: Chelmaxions; The Savantasse of Montparnasse; Journeyman; Leaves of Absence; and A Lied of Letterpress. His volumes of verse translation include The Aeneid of Virgil, a University of California Press volume (now available from Bantam) for which he won a National Book Award; the Inferno, Purgatorio, and Paradiso volumes of the California Dante (now available from Bantam); The Odyssey of Homer (now available from Bantam); The Metamorphoses of Ovid, a finalist for the Pulitzer Prize in poetry; Ovid in Sicily; Selected Poems of Giuseppe Ungaretti; Selected Writings of Salvatore Quasimodo; and David Maria Turoldo. Mandelbaum is co-editor with Robert Richardson Jr. of Three Centuries of American Poetry (Bantam Books) and, with Yehuda Amichai, of the eight volumes of the JPS Jewish Poetry Series. After receiving his Ph.D. from Columbia, he was in the Society of Fellows at Harvard. While chairman of the Ph.D. program in English at the Graduate Center of CUNY, he was a visiting professor at Washington University in St. Louis, and at the universities of Houston, Denver, Colorado, and Purdue. His honorary degrees are from Notre Dame University, Purdue University, the University of Assino, and the University of Torino. He received the Gold Medal of Honor from the city of Florence in 2000, celebrating the 735th anniversary of Dante's birth, the only translator to be so honored; and in 2003 he received the President of Italy's award for translation. He is now Professor of the History of Literary Criticism at the University of Turin and the W.R. Kenan Professor of Humanities at Wake Forest University.